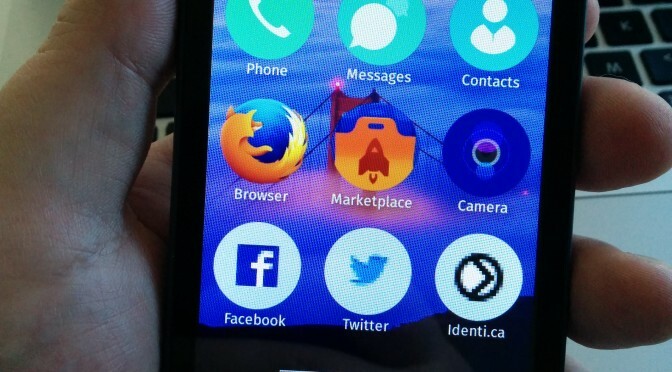 Ever since I heard about Mozilla’s ‘Boot2Gecko‘ project a few years back I was very excited about the eventual possibility of Firefox-powered phones running a truly free operating system, with apps provided through the open webÂ instead of platform-lock-in walled gardens. It’s been a long journey though, and often a painful one. Early versions of Firefox OS were pretty rough, it was hard to get phones that weren’t severely underpowered, and actually upgrading to the latest versions on a release phone was….. often not really possible. 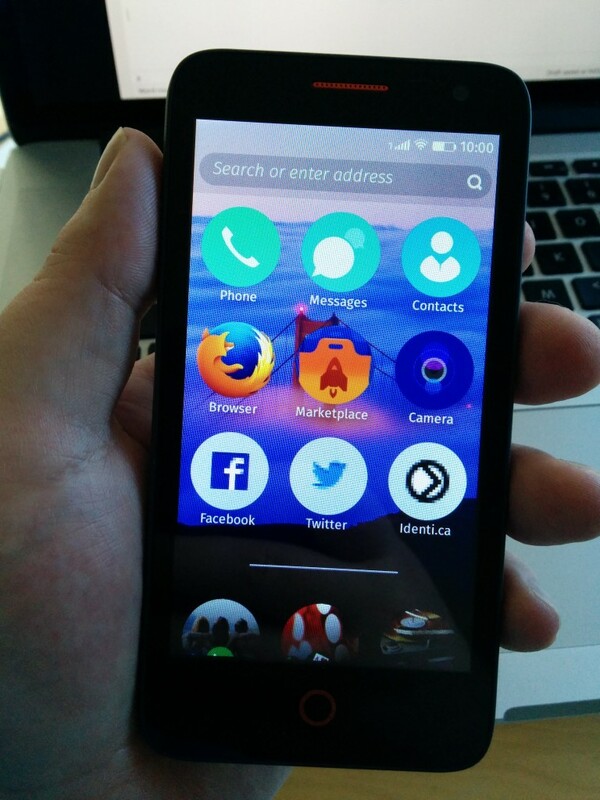 So I finally gave in and picked up the Flame, which is the officially recommended Firefox OS reference device. Current builds are actually, like, published for it! I immediately flashed the device to the current base image (v180, with a low-level ‘Gonk’ layer based on Android 4.4’s low-level Linux layers) and updated to the almost-ready-for-release Firefox OS 2.1. Version 2.1 finally does away with the old crappy browser app and treats web site browsing on the same level as installed ‘apps’. Graphics are pretty smooth, using hardware compositing, and in general it’s a HUGE improvement over 1.x. The Flame is meant to be representative of the next generation of Firefox OS release phones which are targeting developing markets, so it’s not as fancy as the latest Android or iOS devices. The screen is only 1.5x density, versus 3x on my Nexus 5. But it’s still a big improvement over the older 1x 320×480 devices. Decent 1GB RAM — can be configured lower to simulate lower-end devices, which I have not attempted. Eek! There’s a limited amount of internal storage, and a micro-SD card slot where you’re expected to store additional files such as media. I only had a 4GB card handy from an old phone so I’m using that for now, but will replace it with a 32GB card later. the Flame has 2 SIM slots, both full-size. This meant I needed a micro-SIM-to-fullsize-SIM adapter to get my main phone line running on the Flame. The micro-SIM kept popping out of the adapter while trying to insert it, but I eventually got it in intact and it’s working fine. (T-Mobile US, HSDPA speeds. No LTE support on the Flame.) Conveniently the adapter kit also included the necessary adapter to move my backup/testing phone line from my iPhone 5s (nano-SIM) to the Nexus 5. Why can’t we all just use the same damn size SIM? The camera seems kinda awful; video framerate is bad. Not sure if this is a software bug or a hardware limitation but it’s a bit of a bummer. Gmail shows in a really crappy old-school mobile web interface instead of the nice modern HTML5 one you get on an Android or iOS device. I can’t seem to use it for multiple accounts either, which makes it a non-starter since I have both personal (gmail) and work (gapps) accounts. I’ve been using the Firefox OS built-in Email app instead for now, which seems to work better than in old versions but isn’t really optimized for my ‘archive everything’ workflow. Facebook web seems pretty decent at least for reading, but I don’t get notifications of replies and have to check manually. Twitter web seems pretty good, though the pull-to-refresh is a little flaky and again no notifications. There’s really nothing in Uber that needs to be an app as a customer — they could just as easily have a web app with all the capabilities of looking up, calling a car, watching the map, etc. I can’t even successfully log in to their web interface for viewing my past rides, but if I could there’s no way to call a cab there. I occasionally use Skype, mainly when XBox Live’s chat system breaks. *cough* Microsoft owns them both *cough*. That’s all native apps and has no web option. The Walgreens app on iOS/Android lets you scan the barcode on your medication to schedule a refill, it’s pretty handy! Their web site has no equivalent that I can find… but I can work around it by renewing via email notification instead. So I’ll be carrying the Flame around as my main phone line for at least a bit, but I’m gonna keep the Nexus 5 around for a few things.